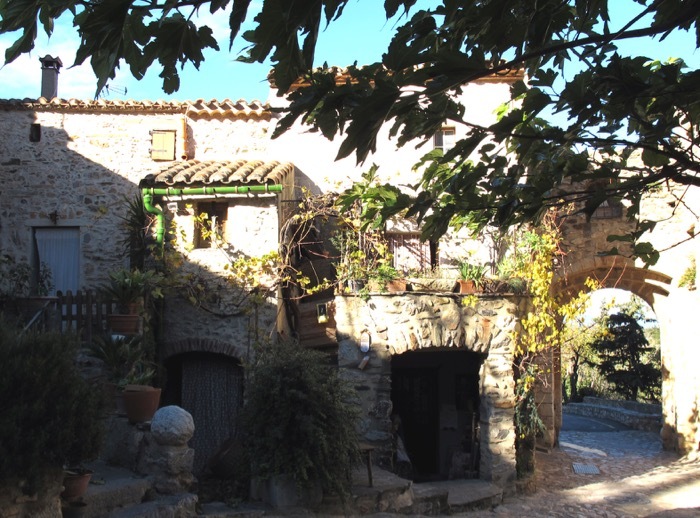 Castelnou, along with Eus (near Prades) is officially listed as “un des plus beaux villages de France”. Although deserving of such an accolade, one wonders how villages get designated thus – one imagines a French civil servant (fonctionnaire) scouring the land with a hand-held “beauty-ometer”, noting when the the dial goes above 10! Topped by a rather austere castle (open for visits daily), the ancient village of Castelnou tumbles down the hillside below. One can spend a pleasant half hour just wandering around the cobbled streets and alleys, but what is remarkable here is the sheer quantity of workshops and galleries. You will come across wood-turners, potters and painters creating their wares in intriguing spaces, sometimes cut into the rock of the hillside. As well as permanent exhibitions there are some galleries that host temporary shows, such as the delicate card creations of Sabbah Mine, who is exhibiting there in September. You can also buy local honey and fruit juices from the épicerie near the village entrance gate or visit the witch! Needless to say, there are also a few restaurants and cafes to cater for the large number of visitors. The only down-side is the recently introduced 3 Euro flat-rate parking charge in the main car park – probably acceptable if you want to spend an entire morning or afternoon there, but not if you are making a brief visit. And you cannot even get to Castelnou on the Department’s generally ubiquitous and admirable one Euro bus service. There is free parking at a magnificent viewpoint (of Castelnou, with the Canigou in the background) about 1km before the village, on the road from Thuir. The canny and fit can leave their cars there and walk into the village!